Brother of the famous Manfred von Richthofen, Lothar transferred from cavalry to aviation in late 1915. He served as an observer during a whole year, but in early 1917 he was attracted by his great brother Manfred to become scout pilot within Jasta 11. He experienced rapid victory run during April/May 1917 but was wounded. In September 1917, after his return from hospital in September 1917 he took command over Jasta 11. He was wounded again in March 1918 and returned to the unit in July 1918. After scoring final 11 victories he was severely wounded again and grounded permanently. After a war Lothar returned to flying, but was killed in an accident in 1922. In his early career LvR was assigned with Albatros D.III. His plane was left in factory finish and had red band applied behind the cockpit. After returning to Jasta 11 in autumn 1917 he was surely assigned with Albatros D.V or D.Va but I don't know anything about the plane. 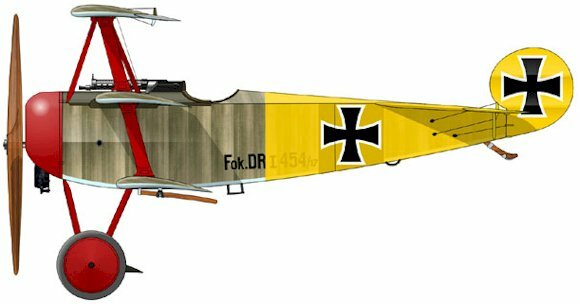 In Spring 1918 Lothar flew Fokker Dr.I 454/17. He was shot down and crashed with it. During his brilliant but short exploits in August 1918 he flew many Fokker D.VIIs. The Fokker no. 244/18 with b/w checkered tailplanes and yellow nose shown in In Action book was in fact Aloys Heldmann's not his own plane, although LvR used it once or twice. It is supposed that LvR flew also the same red/white D.VII which was used by Udet. Other sources show LvR's Fokker as a plane with red front fuselage half and yellow rear fuselage half. May be it is in fact red/white Udet's finish interpreted as red/yellow because of traditional Lothar's colors. This colorful Dreidecker no. 454/17 was used by Lothar in Spring 1918. I assume that he scored his three March victories with it. Its camouflage was typical: "Fokker finish" over clear doped linen with turquoise bottom surfaces. White fields of Patee crosses were overpainted with a dark color, probably olive green, with thin white outline left around the crosses. Red cowling, struts, undercarriage legs and wheel disks represented attachment to Jasta 11. Yellow tail was Lothar's personal touch. Contrary to common opinion top wing was not painted yellow (Windsock Vol. 8, No. 6, Dec 1992 via David Calhoun). According to Dan-San Abbott demarcation line for yellow tail was located aft of the cockpit and not only turtledeck, but both boards and belly were painted so. This is the revision I made after I had drawn the profile first time. Most aces were known only because of their war exploits, their score and courage. But Josef Jacobs was not the case. He was perfect pilot and brave flyer, and this provided him with fourth position on the German aces' list, but Jacobs showed also to be a smart businesmann and courage enough to refuse Goering's approachs to participate in Jacobs' company. At the time of outbreak of the Great War Josef Jacobs was twenty years old and had learned to fly for two years. Soon after war begin he was enlisted to Kaiser's Army and began flying with FEAs 9 and 11. Within the latter organization he was assigned with Fokker E.III scout and joined so-called Fokker Staffel West. This temporary unit was renamed KEK West and was used as a nucleus for new Jasta 12, but Jacobs moved to new Jasta 22. In summer 1917 Jacobs was already an ace with 5 confirmed and 8 unconfirmed victories. On August 2nd 1917 he was appointed to take command over Jasta 7, as its formed commander Fritz von Bronsart-Schellendorf had been killed in action. At the end of year 1917th Jacobs' score stood at 12 confirmed kills. In early 1918 Jasta 7 received first Fokker Dr.Is, and Jacobs simply fell in love with them. He was so used to fly Triplanes, that he preferred them over much vaunted Fokker D.VIIs, and he could be seen in his black Dr.I well into October 1918. It is said that more than 30 of his victories were scored with Dr.Is. In fact Jacobs was one of a few German aces who liked Dreidecker scouts. Unlike other pilots he was crazy enough to attract enemy fighters to attack him and turn rapidly into them using Dr.Is superior maneuverability. Usually such tactics would be considered as suicidal, but in the case of Jacobs it surprisingly worked. At least it was a chance to use Dreidecker's only advantage against faster scouts. After the Great War had been finished in the West Jacobs continued to fight in the East. He joined Kommando Sachsenberg in Baltic States and helped to stop Bolshevik advances in 1919. Later he was an instructor in Turkish Army, but then he withdrew from military activities and moved to aviation industry. In thirties he founded his own company and refused to join Luftwaffe. As anti-nazi character, he evaded Goering's pressure and moved to Holland. During World War II he was hidding and succeed to avoid captive despite Goering was looking for him. After the war he returned to business activities. He passed away in 1978. In 1916 Jacobs flew Fokker Eindeckers, and there is an existing photo showing Jacobs standing in front of one of them. I haven't seen this photo so I cannot describe its markings. it is know that Jacobs flew Halberstadt D.II, but not much is known about it. Dan-San Abbott made a conjectural drawing once, but he showed only plain finish. In first half of 1917 he flew Albatros scouts with Jasta 22. At least one of them is pretty well known: LVG built Albatros D.II 1072/16 marked with black three pointed star and black name "Kobes". A photo and a profile of this scout can be found in Osprey Albatros Aces book. Later Jacobs took command over Jasta 7 and flew later models of Albatros scouts. His D.V had lozenged wings and black fuselage with two diagonal bands painted behind cockpit. Jacobs added two smaller Pattee crosses onto the top wing of the D.V. Again, use Ospery Albatros Aces book as a reference. 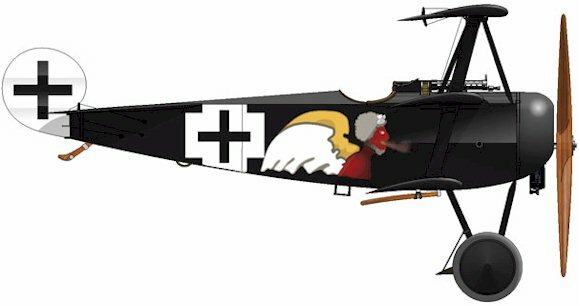 In an interim period in winter 1917/1918 Jasta 7 flew Pfalz D.III scouts, and it is known that Jacobs used one of them. It is supposed to be all black, but no more details are known. In early 1918 Jacobs switched to Dreideckers, and an aircraft no. 450/17 became his favourite mount. This plane is shown below. Except of that Jacobs had his reserve aircraft no. 470/17. It is supposed that it was well known all-black Dr.I with white crosses. 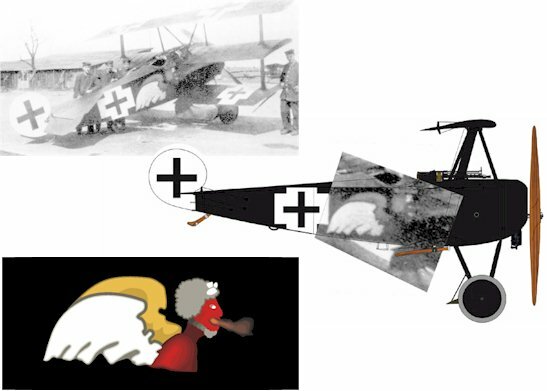 According to Bob Pearson at the end of the war Jacobs may have been using simultaneously all-black Fokker D.VII with a badge similar to that painted on Dr.I no. 450/17. See Bob's pages for more details. It is probably the best known Jacobs' mount: a Fokker Dr.I no. 450/17. It was fitted with captured Clerget engine and undercarriage airfoil reinforcement developed by Jasta Boelcke ground crews. Jacobs' plane was painted overall with semigloss black, and there is no doubt about it. Anyhow the shape of the devil painted on the board is more difficult to research. There is a surviving photo of this plane but it is not sharp enough to replicate badge exactly. Jacobs portrayed his badge again in 1974, but IMHO this hand made picture brought some confusion. Although I don't know any photo of bottom surfaces of A/C no. 450/17, existing photo reveals clearly upper surfaces. Note Jacobs' habit of painting additional crosses on the upper surfaces. 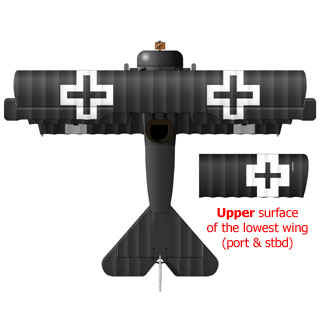 Also note that the crosses painted on the upper side of the lowest wing were odd: relatively small black crosses with huge white outlines. The colors, of course, remain a mystery. Taking post war artist's drawing into account I interpreted devil's colors as red body, gray hair, white nearer wing and yellowish back wing. Dan-San Abbott's interpretation of 62nd RFC Squadron Report on LvR's Dr.I markings. Bob Pearson "Colours & Markings of the World's Air Forces 1912-1920" CD-ROM R. N. Pearson 2000. Many thanks for Dan-San Abbott and David Calhoun for the help.